Bushmeat is an important source of animal protein in both rural and urban households throughout Africa (see Box 4). The magnitude of exploitation and consumption, however varies from country to country and is determined primarily by its availability, but is also influenced by governmental controls on hunting, socio-economic status and cultural prohibitions. In areas where wildlife still exists people collect, hunt or purchase and eat bushmeat for a variety of reasons. Some people depend on bushmeat for their animal protein supply because they have no other source or cannot afford alternative sources; others eat bushmeat as a matter of preference or as a luxury item/delicacy to be eaten on special occasions. For the former group, all species of wild animals are accepted as comestible. while the latter group will go to great lengths and are willing to pay high prices for their choice species. The reality in Africa, is that for the greater majority of rural people, bushmeat represents a vital dietary item for a complex combination of reasons dictated by lack of alternate sources. financial limitations, preference and cultural values. For such people, wild animals constitute a valuable food resource which cannot be easily withdrawn or replaced without causing wide-ranging socio-economic imbalances. A considerable amount of work was done in the 1970s and early 1980s to document bushmeat consumption. particularly in West Africa. The data on consumption however, were mostly based on estimates of the number of people who eat bushmeat or on estimates of bushmeat contribution to national protein supply. Some of the earlier studies in the region gave annual wild animal consumption figures ranging from 20% of the animal protein among rural people living in Nigeria's rain forest areas as compared with 13% in the whole country, to 75 % in rural Ghana compared to 9.2% nationally, 70-80 % in Cameroon's forest zone compared with 2.8 % for the entire country and as much as 80-90 % in Liberia (Ajayi, 1979; Asibey, 1977). The basis for these estimates were often questionable and some authors have attributed the high figures to "over-enthusiastic advocacy of the value of bushmeat". Some more recent data are available on bushmeat consumption in individual households and communities in a few areas within Africa e.g., a survey conducted in 1987 in Bukavu, Zaire indicated that 72% of the population in the town consumed bushmeat regularly and the yearly bushmeat consumption of the town was estimated at 400 tons (Keita, 1993). Bushmeat consumption in Côte d'Ivoire was estimated at 83,000 tons in 1990, valued at US$117,000,000 (Feer, 1993) and in Liberia, it is estimated that three quarters of the country's meat production comes from bushmeat, with subsistence hunting yielding as much as 105,000 tons of meat annually (Anstey, 1991). 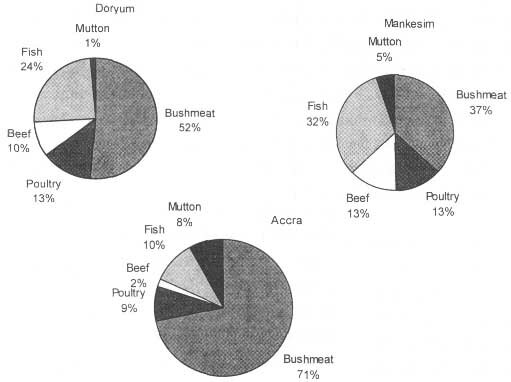 Estimates of meat consumption in Cameroon in 1981 was 33.1 kg per person per year or 9 gm per day, of which bushmeat accounted for 8.8 %, with 34.1 % coming from fish and the rest from domestic sources (beef, 27.5%; pigs, 9%; sheep and goats, 6.2 %; dairy products, eggs and imported animal products, 10.4) The proportion supplied by bushmeat represented 28,500 tons of bushmeat per year (Gartlan, 1987). Among village communities, Infield (1988) estimated bushmeat consumption of 100 kg per person per year in villages around the Korup National Park (Cameroon) as compared to a consumption of 250 gm per adult per week in a Ghanaian village, Akyem Ayirebi (Del, 1991). Consumption levels ranging from 67333 g (modal class 100- 150 g) per person per meal were recorded at chop bars in the city of Accra (Tutu et al.., 1993). The minimum quantity eaten per person at one sitting (i.e. 67 g) was 175% of the per caput daily protein intake in Ghana (FAO, 1986) and 120% of the daily nutritional requirement. Studies on volume of bushmeat production in Africa tend to be restricted to small areas and the only indication of volume of bushmeat produced by countries are the estimates published by the Food and Agriculture Organisation (FAO). These estimates based on the limited records reported to Wildlife Departments or on food consumption surveys such as those reported by FAO. The limitation of such data is that they neither capture the actual volume of bushmeat exploited nor cover the entire range of species taken. Species such as rodents, snails and insects, which are often consumed by the hunter and his family, hardly appear in the markets and therefore do not appear in the statistics. The situation is amply described by Prescott-Allen & Prescott-Allen (1982) in the statement "when a hunter sells his catch to a neighbour or pops it into the family pot, he rarely tells a statistician."  the limited infrastructure: facilities for recording bushmeat off-take and sales are often undeveloped or at best inadequate. Bushmeat production estimates published by FAO for selected countries are reproduced in Table 2.1, which also gives the contribution of bushmeat to daily protein intake. These estimates are based on very limited data and have value for comparisons between different countries rather than as absolute production figures. In the same vein, the figures for bushmeat consumption do not reflect the real situation that pertains in many rural African communities. The need for more studies in this area cannot be over-emphasised. Benin Bushmeat is commonly sold in markets and is preferred to meat of domestic animals. The grasscutter (cane rat), Thryonomys swinderianus is the favourite species for most people (Baptist & Mensah; 1986). Bushmeat production was estimated at 20,000 tonnes valued at 40 million F CFA in 1989. Cameroon Bushmeat is an important part of the diet of many urban and rural Cameroonians providing an estimated 70-80 % of animal protein consumed in the southern areas (Ajayi, 1979; Belisle, 1987). Species consumed include snails, caterpillars and other insects. 8.8% of the estimated 33.1 kg of meat consumed annually by each Cameroonian was contributed by bushmeat (Gartlan; 1987). CAR For the Aka Pygmies, bunting is an essential way of life (Motte-Florac, Bushmeat is not only the main source of protein, but also provides income and an item to barter for carbohydrate food items. An attempt to estimate bushmeat production over a wider area was made by Adeola & Decker (1987) who conducted a survey on utilisation of bushmeat by farmers and hunters in three ecological regions (rain forest, deciduous forest and Savannah) in Nigeria. Bushbucks and duikers were found to be the main large mammal species harvested in all three ecological regions and provided 6.1 animals per month in the Savannah zone as compared with 4.9 in the deciduous forest and 3.6 in the rain forest. Small mammals formed the bulk of animals exploited. Of the small mammals, three rodents, the grasscutter (cane rat), giant rat and squirrels were the most abundant providing 41.7 animals per month in the savannah, 27.5 in the deciduous forest and 26.2 in the rain forest (Table 2.2). The study estimated that a total of 1.263,000 metric tons of bushmeat, comprising small and large mammals but excluding elephants, were harvested by the farmers per month during the rainy season. This was made up of 696,000 metric tons from the savannah region, 183,000 from the deciduous forest region and 385,000 tons from the rain forest region. Unlike areas in Central Africa where bushmeat is still relatively abundant and accounts for the greater proportion of household animal protein consumption, the actual contribution to total protein intake in West Africa is presently very low. Bushmeat was not a regular part of the diet of over 70 % of the people interviewed in the Ghana study by Tutu et al., (1993) and bushmeat contributed less than 5% of the total animal protein intake in both rural and urban communities. Fish accounted for the greatest proportion of animal protein intake (Fig. 2). The current low contribution of bushmeat to the protein intake in the region was attributed to scarcity, relatively high prices and the unavailability in small affordable pieces, particularly in the rural areas' since most of the hunters catch were sold as whole animals to be retailed in city markets. Thus, whereas in the past bushmeat was the most common source of animal protein, it is currently a luxury item, eaten only occasionally in most homes, and for those who relish bushmeat but cannot afford the cost of purchasing it for use in their homes, the chop bars remain their main source of bushmeat dishes. The scarcity of bushmeat has resulted in a situation where any wild animal is acceptable as comestible and people have resorted to exploiting and marketing whatever they can find including a variety of small animals which in the past were not eaten at all or were only eaten by children.